Hand-made fashion and accessories, designer objects, paintings, drawings, etc. 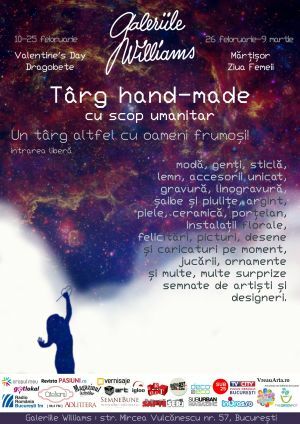 The fair is organized in order to help a single mother of five, all students of the Music College in Bucharest, which currently is facing severe financial difficulties. "Hand-made Fair " Fair in Bucharest. You can get here description, reviews, address, time and details of "Hand-made Fair " Fair in Bucharest. Visit Bucharest Tips for more Fair events in Bucharest!